It’s hard to believe that Dart Music Festival is now a mighty twenty years old..! Since its inception in May 1998, the Festival has grown from a great idea had by a small group of music-loving friends – Rob and Di Lyon, Nigel Way MBE and the late Roger Kempton – in order to ‘fill a gap’ between Easter and Regatta, to one of the most successful and popular festivals in the South West. “NOSTALGIA AND VISION…We are delighted to celebrate and commemorate 20 years of live music that is the DMF. The nostalgia is for a simple idea being hatched whilst at Kinsale Jazz Festival in October 1997 and being planted in the fertile soil of this lovely town. Would it work? An out-of-season Festival inviting as many different music styles as we could and making it free? Local people supported and welcomed the notion, enjoyed the variety and experienced music, poetry and performances in places not used before; like Bayard’s Cove Fort, the Orchard, the battlements at the Castle, and the silly idea of a pontoon in the middle of the Boatfloat, subject to the vagaries of the tides, and asking our beloved Band of HM Royal Marines perform on it! Oh, how we laughed! …but how proud we are of the members of the DMF Committee for making it thus! The vision by the people who have taken this event on to these heights of affection and respect, from both audiences and performers, is to be praised. The team of volunteers work tirelessly all year round to fund, organise and stage fabulous music. The variety of music has widened, the involvement of the community has increased and its ethos of ‘Music for All’ has been consolidated. We send our sincere thanks and best wishes to the Committee, sponsors and audiences. Have a wonderful festival and we look to its continued success. With love and respect”. Rob and Di Lyon – DMF Presidents & Founders. Wonderful words from some very special people – without them this Festival would never have been, so let’s have a big three cheers for Di, Rob, Nigel and Roger… We in turn give our love and respect to those clever Co-Founders who had the determination to make their music dream come true – and in doing so have given so much fun, pleasure and enjoyment to so many people for twenty fantastic years. Hip, hip – HURRAY!!! The Festival may have grown in size but the original ethos still remains: ‘Music For All’ really does do what it says on the tin, with a huge variety of musical genres all over town for all to enjoy – and completely free of charge. We hope you will too – have a great time! 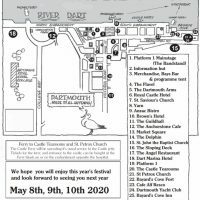 ‘Celebrating Twenty Years of Dart Music Festival – Let the Good Times Roll’ by Carole Hart Fletcher.